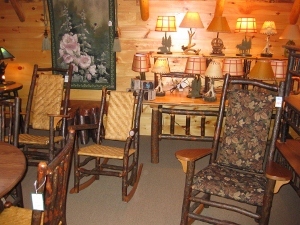 Owls Head Mountain Rustic Furniture Gallery has hundreds of outdoor and indoor rustic rockers for you. 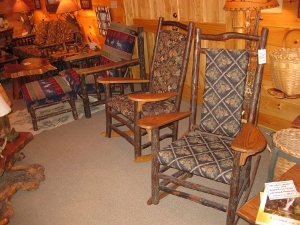 Our craftsmen are busy year round designing and upholstering our latest style of new rockers. 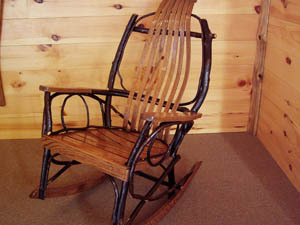 Our Hickory and Oak Rockers are only $139.00 each! 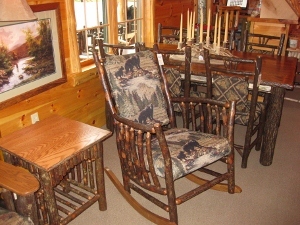 Our bent hickory rockers are a tradition here in the Adirondacks; once you sit in one of our comfortable rockers you'll have to take one home! 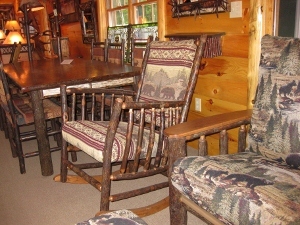 Our new Cascade Rocker is made with kiln dried hickory and has plenty of room with deep seats and comfortable backs that are beautifully upholstered in different North Country designs. 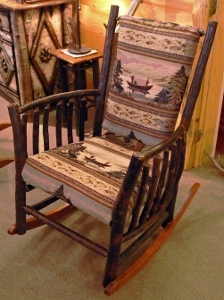 Try an old-time favorite tall-back Paddle-arm Rocker that is hand woven in wood splint or upholstered. 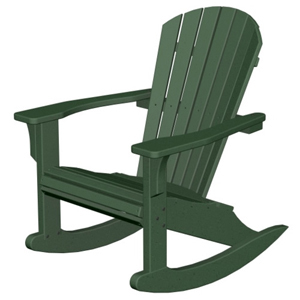 We have a nice selection of outdoor rockers that are great for lawns or exposed porches. 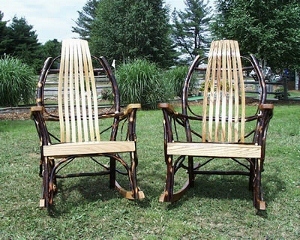 Our latest additions are Eco-Friendly Adk folding chairs and rockers that are made from recycled materials. 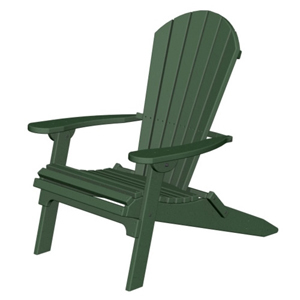 These great looking chairs and rockers are very durable and come in Adirondack green and red. 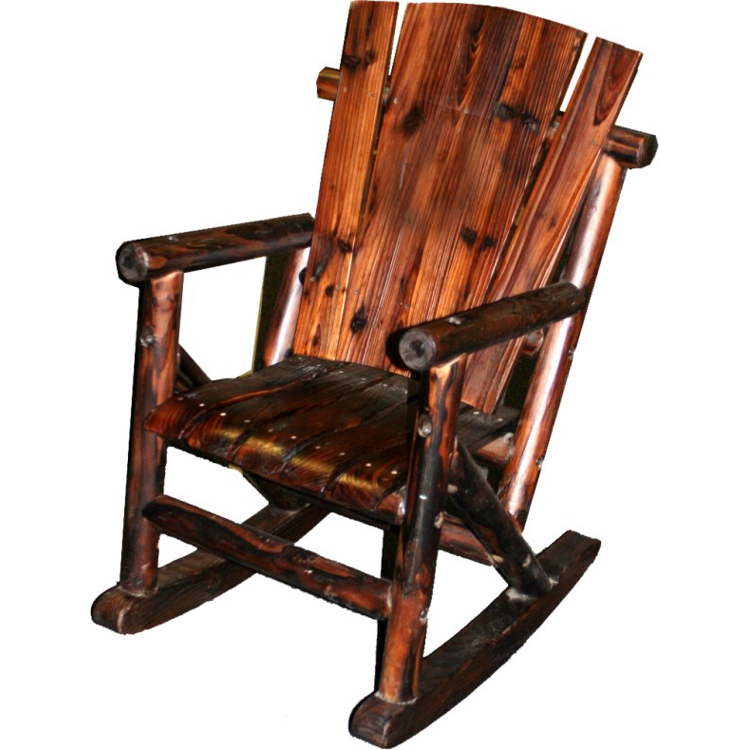 Perhaps you would like one of our outdoor Cedar Rockers with a comfortable seat and weather-proof finish. 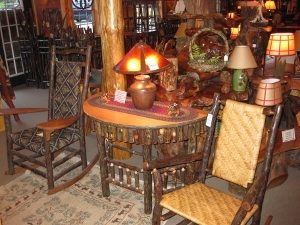 These rockers and matching side tables are weather resistant and are made to be enjoyed outdoors. 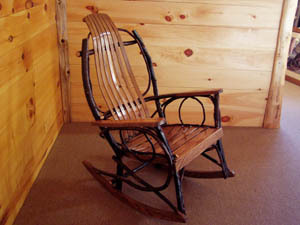 We also have an artisan that makes willow rockers for us that are hand woven the old fashioned way with sweeping twig designs that reflect the old Great Camp style from a hundred years ago.